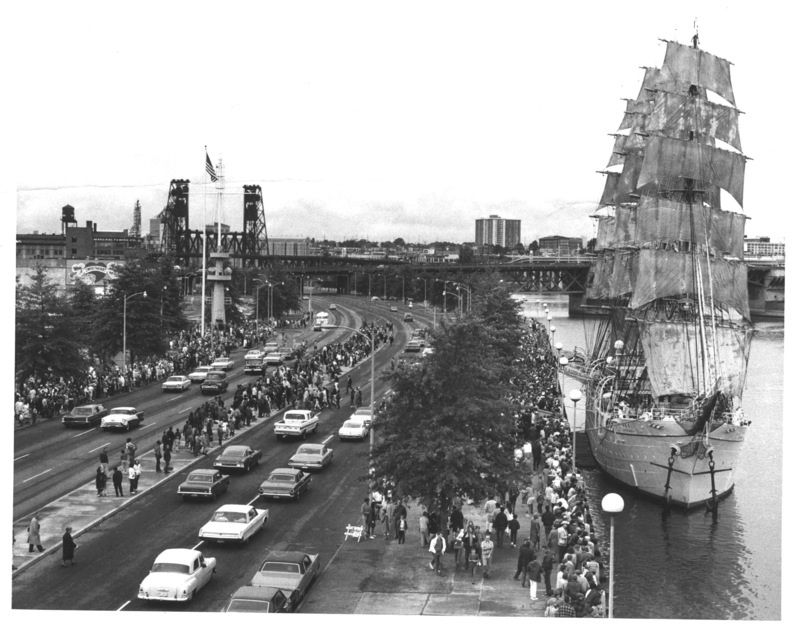 A fully rigged three-masted sailing ship sits tied to the seawall between the Morrison and Burnside Bridges in 1968. This is likely the Nippon Maru, a sail training ship built for the Imperial Japanese Navy in 1931. Harbor Drive had not yet been removed to make way for Tom McCall Waterfront Park. Tom McCall Park was a GREAT idea. I didn’t know there was access to the riverfront like we see here back then. I thought the guard rail was right at the edge. On another ghost sign note, has anyone seen this 12 minute video paying homage to the lost art? It’s fantastic. check out the sailor at the top of the main mast. I drove along Harbor Drive the night before it closed. The next day it began to be demolished. The Japanese sail training ship, Nippon Maru, visited Portland in 1962.(?) I am trying to confirm that that is the correct date. Staff of the Oregon Historical Society were involved in welcoming the ship to Portland.